What’s Wrong with Folkboat Skippers? We were browsing sailing photos from photographer and tireless race committee volunteer Roxanne Fairbairn when we noticed that something must be wrong with Folkboat skippers. It seems the crews do everything they can to get as far away from the skipper as possible. We’ve heard of skipper/crew problems before but this appears to be a universal issue on Folkboats. Unhappy Folkboat crews do all they can to avoid the skipper. Does the short straw mean you have to sit farther aft? We hear they bring snacks to avoid going aft to eat. These crewmembers can’t wait to go to work on Monday. 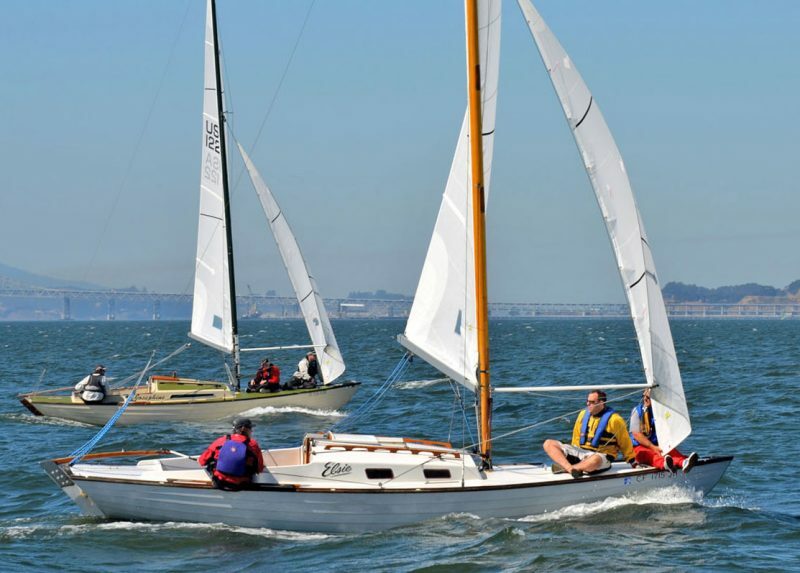 Despite the apparent skipper challenge, the 26-ft Folkboat is one of the most popular classic, one-design fleets on the Bay, and most skippers and crew seem to make up enough to have a good time at the yacht club after the races. 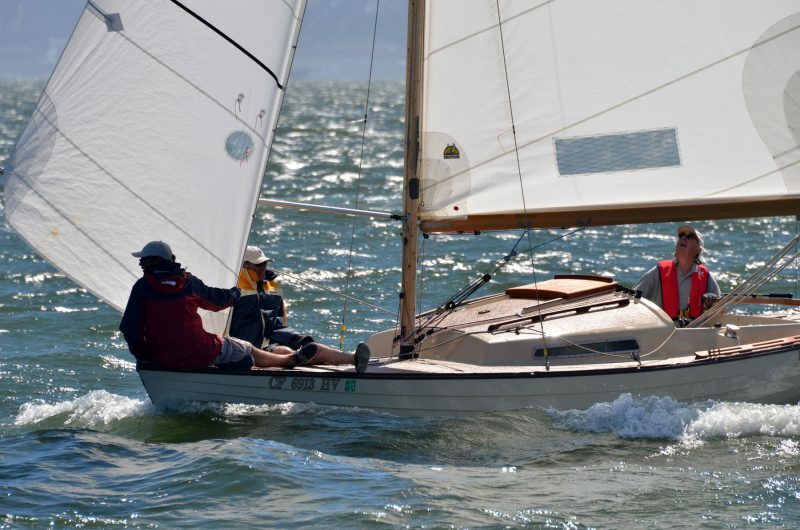 Corinthian Yacht Club in Tiburon will host the Folkboat International Regatta on September 29-October 4, 2019. 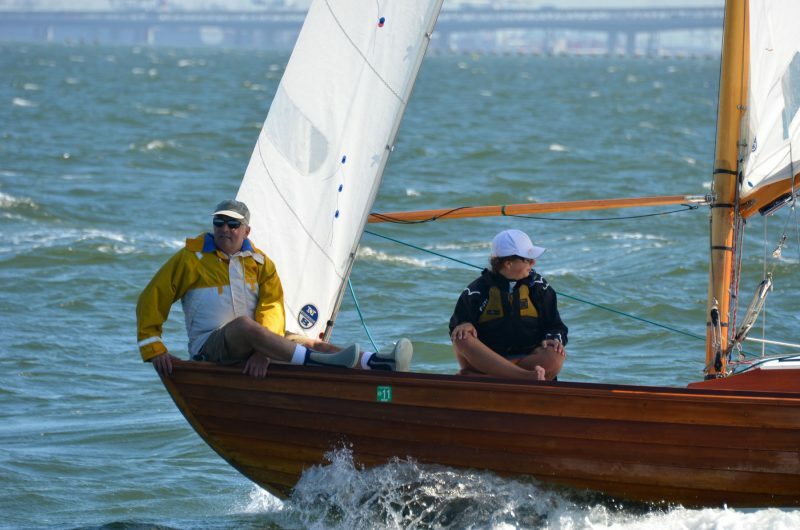 See www.sfbayfolkboats.org for more info. For more of Roxanne’s great photos, see https://roxshots.smugmug.com. The 11th edition of the Route du Rhum solo transatlantic race has continued to deliver thrilling surprises and heartbreaking blown leads, this time in the premier IMOCA 60 monohull fleet. In a shocking development, Britain’s Alex Thomson has grounded Hugo Boss near the finish of the 3,542-mile-long Route du Rhum after leading the division virtually the entire way. The mistake will cost him a 24-hour time penalty and almost any chance at winning the race. Oversleeping an audible alarm and not being woken by his wristwatch that is supposed to ‘shock’ him awake — the battery was out of charge — Thomson’s black monohull ran into the rocks on the northernmost tip of Grande-Terre Island, which makes up the northern half of Guadeloupe. After hitting the island, fortunately at a low-ish speed of just six knots due to light winds on approach to the finish, Thomson dropped the sails on Hugo Boss, started the engine and backed into deeper water where he could assess the situation and resume sailing. With the incident already reported to the Hugo Boss team and the race committee, Thomson resealed his engine and continued under sail, in hopes of still finishing the race. 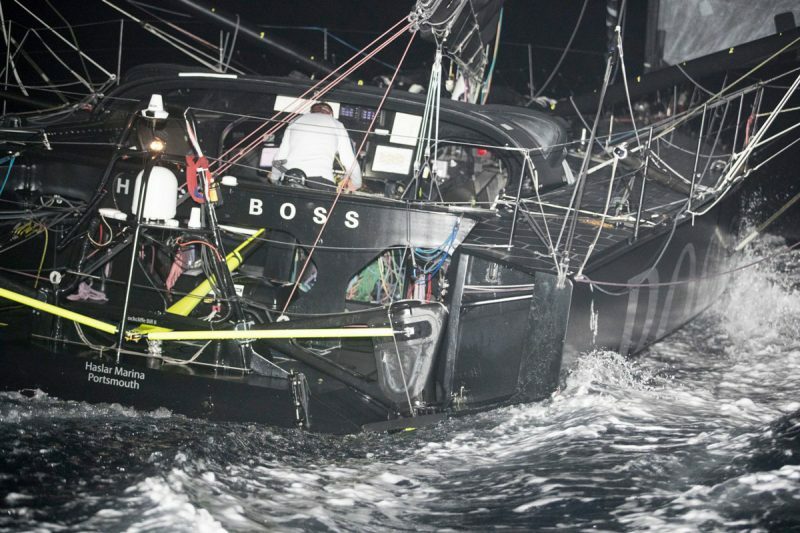 A stricken Hugo Boss sailing toward the finish line in the middle of the night after hitting the rocks off the northernmost tip of Guadeloupe. Before this gut-wrenching plot twist, Alex had quite literally crushed the fleet in his maiden attempt at the Route du Rhum. 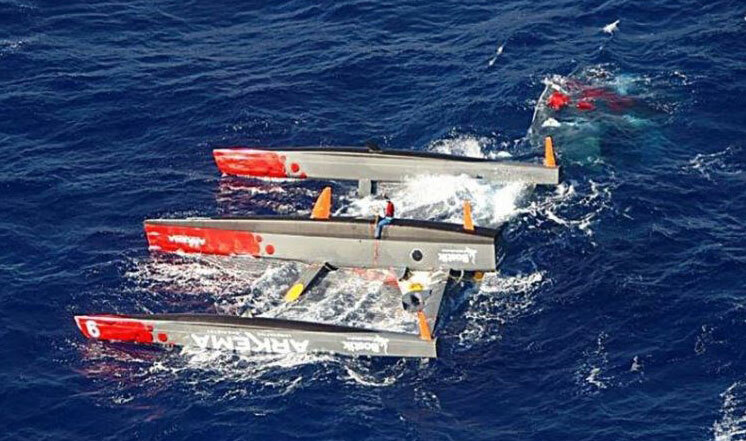 The incident occurred at night, and the extent of damage to the cutting-edge, foiling monohull was not certain, though the light of day has shown it to be mostly superficial and cosmetic. 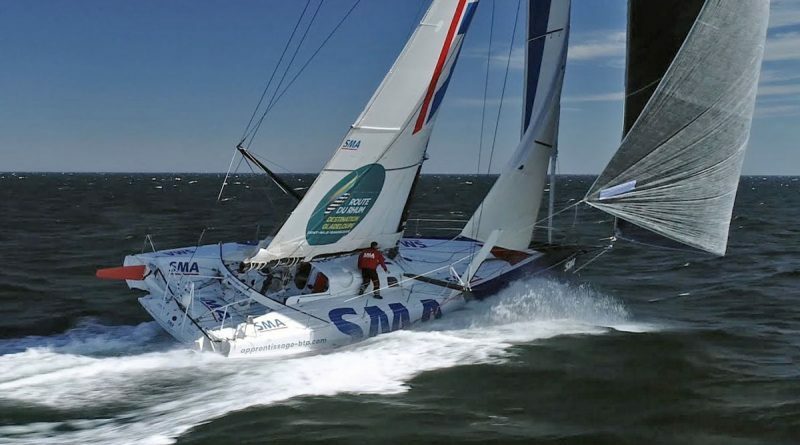 With light winds and moderate seas, Thomson still managed to be the first IMOCA-class racer out of 20 over the finish line. Before bumping the bricks, Thomson had sailed a remarkable race and had extended to a lead of more than 230 miles over second-placed Paul Meilhat on SMA. At nearly every check-in, Thomson showed some type of boatspeed advantage, often 2-4 knots faster than everyone. 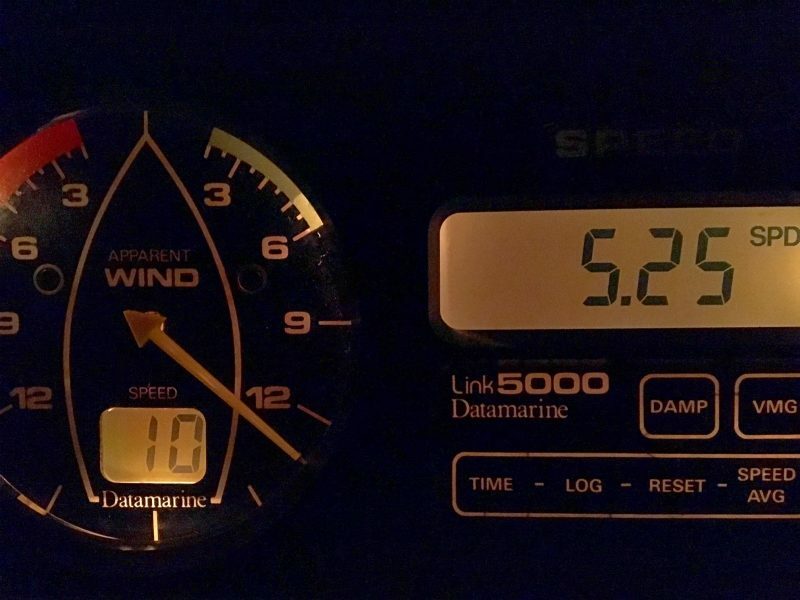 Yann Elies on Ucar – St. Michel is the only skipper who has been rivaling Thomson’s high boatspeeds. Behind Hugo Boss, Paul Meilhat is now entering the lee side of the island of Guadeloupe with a hard-charging Yann Elies just 12 miles behind and closing as the two boats are racing toward the light spot. Whoever reaches the finish line first will almost certainly be declared the winner, in light of Hugo Boss’s 24-hour penalty, which will likely knock Thomson off the podium entirely. Paul Meilhat looks to inherit the IMOCA class lead from Alex Thomson. 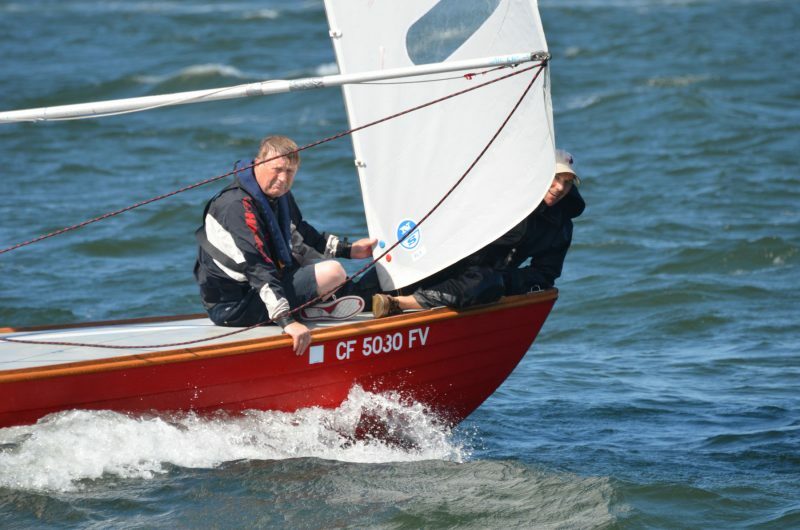 Much has been made of his impressive speed on a boat with straight daggerboards. Most of his competitors have hydrofoils. Armel Tripon on Réauté Chocolat has won the Multi 50 division, while Lalou Roucayrol’s Arkema has capsized mid-Altantic. The skipper is fine and will be rescued by another racing yacht before hopefully meeting up with his boat captain and shore team on a tugboat to go retrieve the overturned trimaran. The 2014 Route du Rhum winner Erwan le Roux has claimed second place with Fenetrea-Mix Buffet. Sailing downwind in reinforced and gusty trades with one reef in the main and a gennaker, Lalou says he was quite shocked that Arkema flipped over. He claims that the leeward float had been taking on some water. He hypothesizes that it was quite full and may have contributed to the capsize. Yoann Richomme still leads the massive Class 40 division over Briton Phil Sharp. American Michael Hennessy has sailed impressively well in a tough race and is in 11th place. French sailor Claire Pruvot collided with a cargo ship south of Portugal. She was rescued by the same ship, as her Class 40 yacht had substantial damage. With triumph, carnage, grand repairs and great despair, there is so much to get excited about in this great race. Make sure to follow the race’s website and social media feeds for more updates. We now bring you part 2 of Mitchell and Quincey’s Truly Cruising (part 1 ran a week ago today). 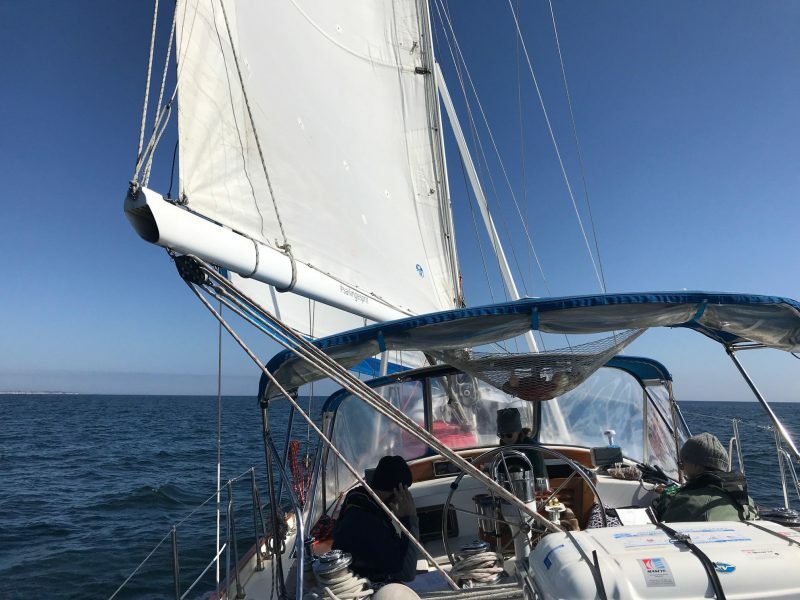 Along with some friends, the couple spent a weekend in Half Moon Bay and Santa Cruz, and were ready to get back out to sea. But they weren’t finished cruising just yet. Our plan all along was to enjoy some overnight sailing, and when better than headed north in southerlies? 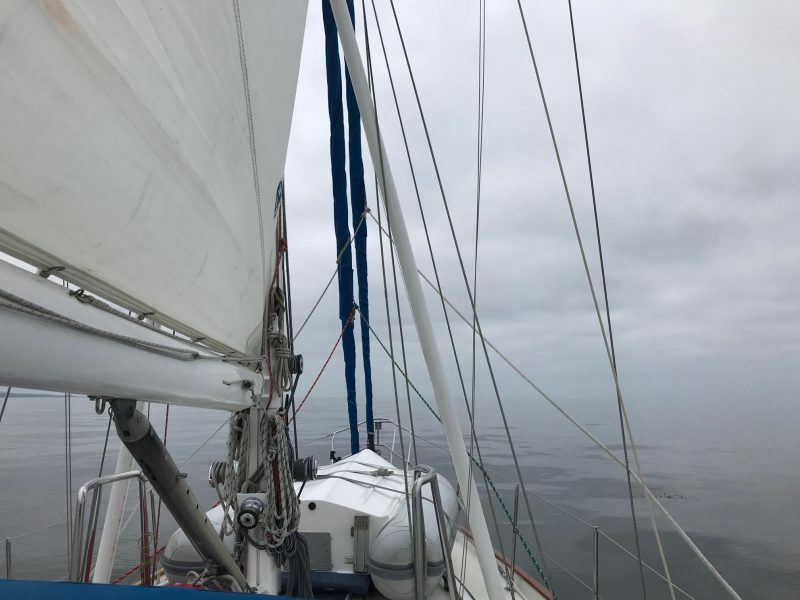 We departed Santa Cruz at 2 p.m. on September 29, set a course south-southwest to add little more room between us, the coast, and San Francisco, and to chase some dying winds farther offshore. Our plan didn’t work as hoped and we ended up motoring until nearly Pescadero. At 9:30 p.m., the wind filled in to 13 knots at 120 degrees apparent, we unfurled the genoa and shut down the engine. The last time we sailed Esprit on a broad reach at night we were leaving the Bay of Panama! That was in March. Since then, we’ve been going upwind in the dark. This was a wonderful change — Q and I spent longer than our watches on deck that night. Motoring south after leaving the main ship channel out of San Francisco. Motoring south after leaving the main ship channel out of San Francisco.I have to profess another merit of center-cockpit boats. Have you ever stepped all the way aft to the backstay and admired the way a boat moves through the waves, with an uncluttered view of the deck and full view of the cockpit and sails displayed in front of you? This is the best vantage to watch a boat sail and dance with the water. The night was clear with an 85% moon but it was wet. The forecast called for some rain on our night passage, but with very little cloud cover, it never materialized. Still, the sails and rigging were dripping and glistening in the moonlight. Besides the 60° cabin temps and 54° on deck, I wanted to believe a tropical rainstorm had just passed over us. The dream wasn’t going to last forever, though, and at 2:30 a.m. the wind died. We were motoring again. Our friends Eric and Chandra ready for their first night passage. I went off watch to grab some z’s in the salon, always ready at a moment’s notice. I chatted with Q about the Golden Gate entrance and reviewed the chart, still expecting her to wake me once we were in the channel. To my surprise, she woke me when it was time to anchor in Richardson Bay. This was a huge confidence boost for us both. 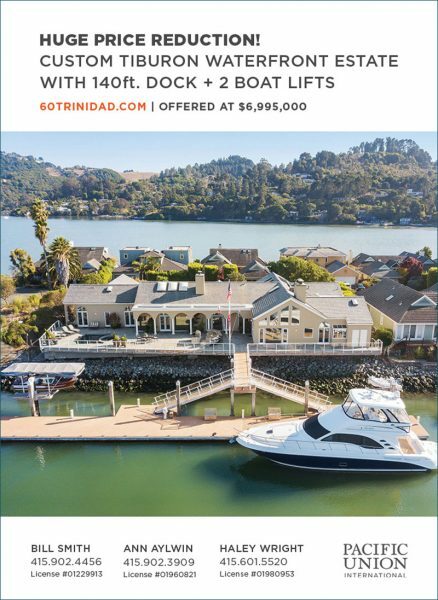 She said there was plenty of traffic but on a clear night, flood tide, and motoring at six knots, it didn’t take long to negotiate. We anchored in Richardson Bay and turned in at 5 a.m. A great sleep was had by all. By 9 a.m., we were awake and ready for a pancake breakfast. We ate in the cockpit as the Sunday morning sailors converged from Sausalito and Raccoon Strait in very little wind. At one point we saw one boat flying a spinnaker west and another east. We figured sailing to Benicia was out of the question and instead decided to just sail until we found a suitable place to spend the last night of our fall cruise. Esprit in all her glory, close reaching to Santa Cruz. We sailed across the Central Bay, and gybed back toward Richmond and into the riviera for lunch. Looking back across the slot showed whitecaps and reefed mains, so we decided to head back across to the lee of Treasure Island and into the South Bay. Evening was falling, so I called into South Beach Harbor. “We’re full,” was the harbormaster’s reply. Well, back to Clipper Cove, I suppose. We covered 20.5 nautical miles in five hours that day and still made it for sundowners at Mersea, the new tapas and wine bar across from the SF Cityfront (a word from the wise, don’t walk through the construction zone that is Avenue of the Palms right now, the security guards don’t appreciate it). We settled into a comfortable evening anchored in Clipper Cove with only a few other boats. This included an Australian-flagged trawler that we suspect had come down from Alaska this summer, truly cruising, but we never saw anyone home for a chat. We all enjoyed sleeping in on Monday morning, and once again had a slow, delicious breakfast. We were waiting for the wind to pick up a little, but by noon, we were ready to call it a trip. We motored to Marina Bay to drop our friends off near their home in Point Richmond and had a wonderful beam-reach sail back to Berkeley. There is nothing wrong with this picture. Clearly, we had a schedule to keep, and that’s never a great thing when cruising. We motored 27 of the 43 hours underway and covered 208 miles in five days. 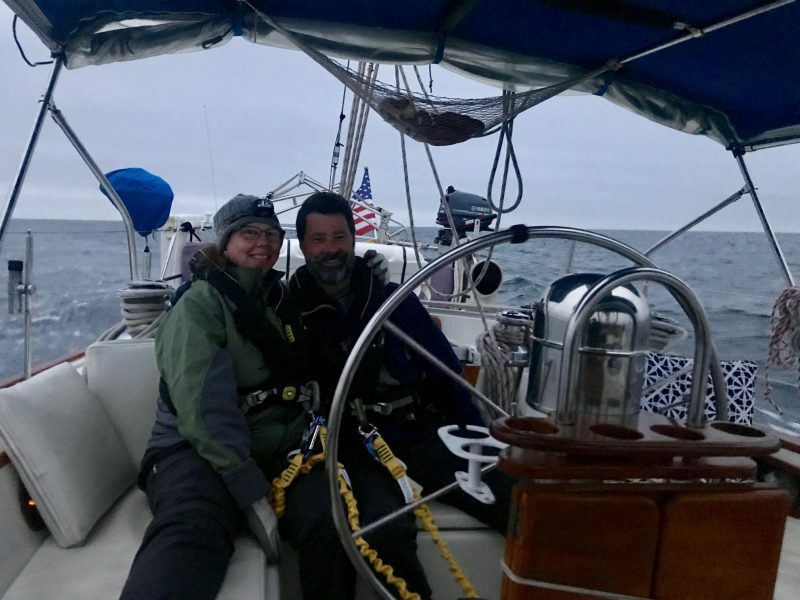 If we had been truly cruising, we would have never left SF with the wind forecast at the beginning of the trip, but being forced to cruise on a schedule actually brought some wonderful sailing that we would have otherwise missed.